Plain white wrapper removed and it looks like a standard ice cream sandwich. For the most part, it tastes like a regular sandwich too but with a nice bit of added sweetness to it. My wafers are a bit crunchy which I am enjoying though I don't know if that's a side effect of the dry ice trip from Buffalo (if you have Perry's locally to you, let me know if their wafers are always crunchy). The funny thing is that the real difference didn't hit me until I finished. The final note here is actually one of chilly cream cheese. I'm not a big fan of cream cheese on a hot bagel, but I do put cold cream cheese on Ritz crackers from time to time and that is the aftertaste I get here. It's not super strong, but it's undeniable. I can't say I've ever had that happen before in an ice cream sandwich. On Second Scoop: I started and ended my day with these sandwiches and I enjoyed both of them. I really dig that cold cream cheese vibe (flavor, not texture) that's not very distinct in my mind with every bite. It's a simple, straightforward idea but it works really well. 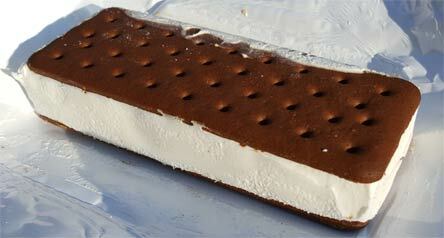 I love ice cream sandwiches and it's nice to have something different yet still familiar like this. On the way into work, I was thinking about how they could build off this with maybe a different wafer or swirled ice cream. I'd love a graham wafer or maybe even something like a red velvet wafer. That reminds me, I should point out that the chocolate from the wafers isn't very strong here and so the wafers allow the sweet cream filling to do it's job. Neat little product Perry's. I am so finally glad to get to try a product you review. Long time NOSH listener. Pie pop lover, but has to travel hundreds of miles to get. I will pick these up. 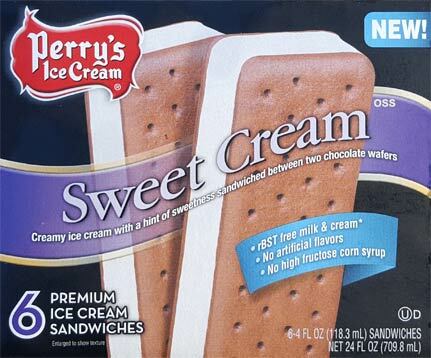 Perry's also announced on their Facebook a new Cotton Candy and Cold Brew Coffee & Cream flavor... if you could review these for us that would be awesome!!! @Caitlin: they sent cold brew coffee but it will be a pretty quick review since I don't dig coffee. I think they sent it because it's completely new while cotton candy is just new to the freezer aisle.